maquette study for "Laughing Lovers"
"A Dame to Kill For"
In architectural parlance, the term design/build describes projects in which the designer is also closely involved in the actual realization ie; the building, of his or her design. Design/Build is an exhibition featuring four artists, Jim Osman, Stephen Maine, Rossana Martinez, and Brian Friedman who respond to their chosen media with a strong sense of design and a resultant clarity and directness that is firmly linked to their active engagement with the hands on processes of making. Their 'buildings' are artworks in which conceptual considerations of exterior and interior space inform their choices of materials, and techniques. Jim Osman brings years of experience as a sculptor working in wood to bear on his large scale plaster murals. With a nuanced feeling for internal structure, a deft use of subtle color, and a craftsman's attention to finish, Osman creates a strong sense of place in his frescoes which typically fill entire walls in site-specific applications. Incorporating references to brick patterns, generic surfacing materials, vernacular archtitecure, and draftmen's elevations and floorplans, he locates his interest squarely in the domain of the humble tradesmen whose labor yields not only shelter, but also a form of straightforward utilitarian beauty. 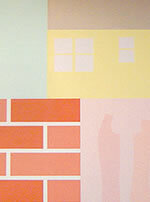 Like any room that has seen life unfold within it, Osman's walls have their own stories to tell. In both his prints and his larger scaled installations combining sheer colored fabrics with mixed industrial sheetgoods, Stephen Maine displays a refined understanding of planar abstraction. His sophisticated layerings of varied materials call to mind the broad expanses of color field painting while creating a tangible experience of texture, movement and spatial depth. 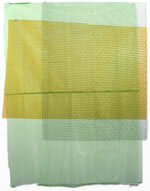 Overlaying broad swaths of open weaved fabrics, with colored plastic and fine wire meshes, Maine creates freely hanging unstretched collages that seem to shimmer as one approaches. Maine's use of carefully chosen pre-existing materials deployed in the 'real' space found just in front of the supporting wall sculpturally counters the illusionistic tendencies of painting while clearly echoing painterly concerns with color and structural relationships. 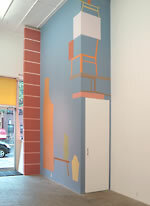 In her installation Rossana Martinez makes use of a finely tuned appreciation of the use of scale in interior space. Responding directly to the gallery she creates a space within it that is at once welcoming, playful, and unexpected, softening the formality that is so often associated with the exhibition of art. Martinez typically employs common and everyday materials in her site specific arrangements, and here proposes a heightened, and perhaps relaxing, aesthetic engagement with the off the rack carpet, wall paint, and colorful bean bag chairs that comprise this work. The contemplation of art offers the viewer a fleeting sense of refuge from day to day concerns, an escape from the ordinary into a world of the mind's devising. Turning this idea on it's head Martinez offers a refuge as art, encouraging the viewer to take their shoes off and share the experience. 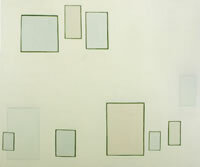 Brian Friedman's paintings are derived in part from the storyboard layouts of graphic novels and comics, locating in their idiomatic design considerations a sort of found abstract poetry. 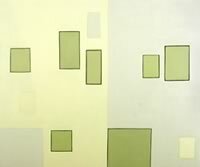 Via his organizing use of the irregular grids and eccentric panel placements to be found in those genre, Friedman works from an authorial position one step removed, creating an operating sphere not unlike that of a designer faced with an existing space defined by existing parameters. His solution to this design problem could not stray further from his sometimes lurid sources. Exercising a subtle, close valued palette and a luscious painterly touch, Friedman empties the frames of their narrative content, transforming the graphic flatness of his found formats into richly textured and highly personal abstractions.